I reckon I’m finally getting the hang of the seasoning thing. I have been trying to really taste the food and analyse the flavours rather then just hoover it down which is my natural instinct. You know when you go a restaurant and the food is amazingly good and you wish you could replicate it? I now know some of the secrets. One of the basics is, of course, great stock. Another is really fresh high quality ingredients. And something that really hits home for me today is the importance of reducing the liquids. Some of you expert cooks will think that maybe I have been a bit slow to cotton on to this but in my defence I am a pretty impatient person, and it takes time to make a good reduction. The cream sauce for the tortellini we make today is a good example. The shallots are sweated, the finely chopped mushrooms added with a bay leaf and then wine is reduced. And then the stock is reduced. And lastly the cream is reduced. I taste enthusiastically throughout the whole process to experience how the sauce develops. When it’s finished it has a depth of flavour that enhances the pasta pockets of veal and a consistency that enables it to nestle around the belly button-like creases of the tortellini. My tortellini doesn’t start off the right shape and by the chatter around the rest of the room, I’m not the only one who hasn’t quite got the knack. I try not to let my frustration show as Chef Francis tells me they don’t look good – I’ve already done about half and there’s no undoing them. Luckily I have heaps of veal filling and once Chef shows me the correct technique, I’m off. I get faster and more accurate with each one and have plenty of perfectly shaped walnut sized pieces to serve at the end of class. The ravioli filled with spinach and feta is much easier to prepare but it still takes time and patience to cut out each mound the exact same size. I hardly need to think about the tomato concassee that goes with it. Blanching, skinning, de-seeding and dicing the tomato for the sauce is almost automatic now. As is the tasting and seasoning. I even have time to lightly fry sage leaves to place a crispy green slither on each tortellini. 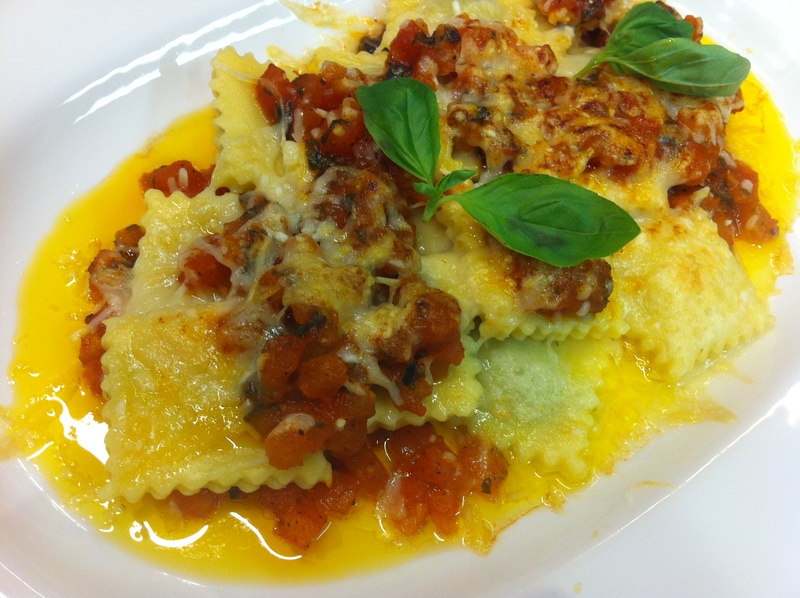 And it’s Chef who’s stuffed at the end of class having tasted 11 tortellini and 11 ravioli. 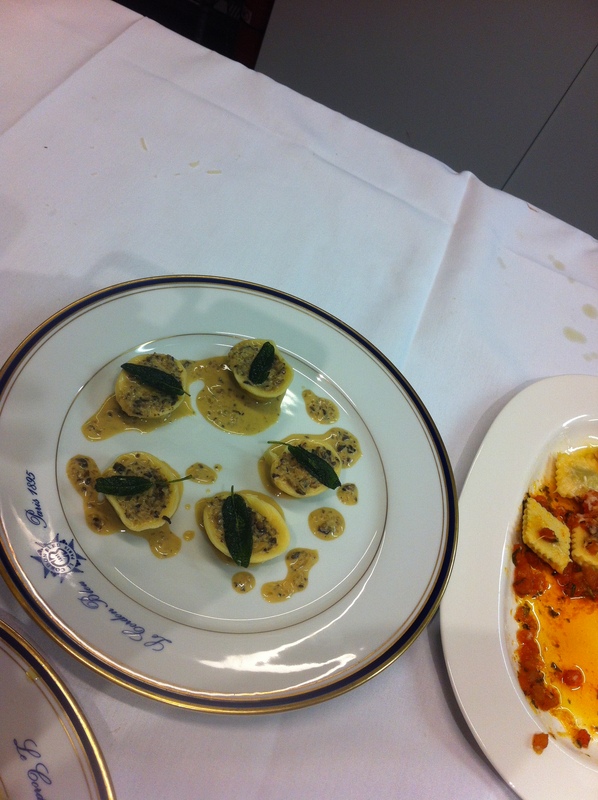 It’s a tough job …..
Ravioli with spinach and feta filling, and yes, that is butter around the plate. Making your own pasta from scratch has to be one of the most rewarding things to do in the kitchen. While I haven’t owned a pasta maker since getting back from Melbourne, it’s well up on my list of things the house needs. I obsess over eating pasta and nothing beats fresh, well made pasta. I’ve managed to do the fresh part of that quite a few times, I’m still a long way off the well made part though.